New York was great. These are a few of my favorite photos from the trip. We spent four days there and packed in as much as we possibly could. We walked and walked and walked. My favorite thing was Central Park. DJ thought riding the subway was cool and he enjoyed seeing the work done at the World Trade Center site. Strong Safety Net for Family Farmers: Obama will fight for farm programs that provide family farmers with stability and predictability. Obama will implement a $250,000 payment limitation so that we help family farmers — not large corporate agribusiness. Obama will close the loopholes that allow mega farms to get around the limits by subdividing their operations into multiple paper corporations. Prevent Anticompetitive Behavior Against Family Farms: Obama is a strong supporter of a packer ban. When meatpackers own livestock they can manipulate prices and discriminate against independent farmers. Obama will strengthen anti-monopoly laws and strengthen producer protections to ensure independent farmers have fair access to markets, control over their production decisions, and transparency in prices. Regulate CAFOs: Obama's Environmental Protection Agency will strictly regulate pollution from large CAFOs, with fines for those that violate tough standards. Obama also supports meaningful local control. Establish Country of Origin Labeling: Obama supports immediate implementation of the Country of Origin Labeling law so that American producers can distinguish their products from imported ones. Encourage Organic and Local Agriculture: Obama will help organic farmers afford to certify their crops and reform crop insurance to not penalize organic farmers. He also will promote regional food systems. Partner with Landowners to Conserve Private Lands: Obama will increase incentives for farmers and private landowners to conduct sustainable agriculture and protect wetlands, grasslands, and forests. We're packed. We're ready. We're off! Can't wait to write an update about the Big Apple. Has anyone heard about Leona Lewis? I saw her new video on VH1 last Saturday and then she happened to be on Oprah this week. She is amazing!! So incredibly talented. Go to http://youtube.com/watch?v=5-ctIC65PV0 to watch her video "Bleeding Love". 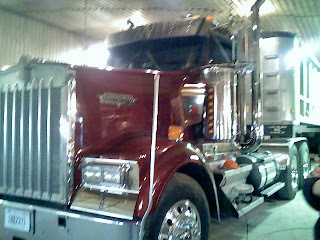 DJ's Truck is FINALLY done. 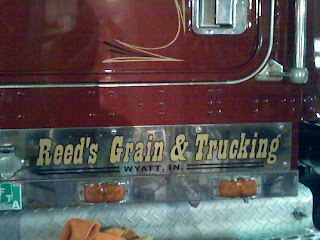 Formerly of Studer Farms (Roanoke, IL), this Kenworth is now part of Reed's Grain & Trucking (Mishawaka, IN). He says he's turning heads on his way to Claypool this morning. I sent Matt and others a forward with pictures of US troops in Iraq brushing their teeth with bottled water in a trench, sleeping on top of vehicles, carrying injured children, etc. It was an e-mail about supporting our trips and appreciating their sacrifice. Matt: I've been meaning for you to correlate this with your Obama support? Heather: Feel sorry 4 them ...don't you? Matt: So, my point on the soldiers is if you ask them they say stay and finish the job......and I wouldn't say I feel sorry for them, it's a chosen lifestyle, volunteer army, and a group that is very proud and motivated to do what they do. Most still believe they are in fact fighting the guys that knocked down the buildings whether rest of us want to believe it or not. I empathize with the struggles they have being away from families and the struggles their families have but especially for those who gave the ultimate sacrifice I think we need to find a productive end, not cut and run. Heather: A good point. They do sacrifice a lot and I agree that we should support them but I think we're getting nowhere and there might be another answer. Heather: Bring them home. Stop spending money. Save lives. Bring families back together. Shut down financial networks that support terrorism. Wean ourselves off of middle east oil. Target terrorists in an EFFECTIVE way. 3 Save lives. >>>>> the men and women on of the 82nd airborne etc would argue that is what they are doing...you want car bombs in baghdad or mishawaka? 4 Bring families back together.>>>> everyone wants families back together...so what. The 'guys' join up [ie your brother] because they are willing to put duty and country before family. Even if we shut down iraq we need 50,000 in afghanistan, we need 10,000 in pakistan and if iran continues to pursure nuclear weapons we'll need 300,000 there. 5 Shut down financial networks that support terrorism.>>>>we've been doing this for years in fact nearly the first thing the president did after 9-11 [9-13] was ask [and he rec'd] authority to seize terrorist dollars and it was widely a world wide effort. A continual effort ofcourse. 6 Wean ourselves off of middle east oil.>>>>> sounds great....will you be buying a prius? I am actually looking at a ford escape hybrid which mike mangold tells me he could get, but they are hard to get and it'll cost me about 20% more to buy. 7 Target terrorists in an EFFECTIVE way.>>>> just finished george tenets book....cia director appointed by Clinton, went on to serve until 2004 or so with Bush. There is probably not much they [cia] hasn't thought of and or tried. They are largely accredited with killing about 2/3 of the al quaeda leadership. Whining over wire taps of those who are suspect of terrorism doesn't help but slow the process down. So if you'd like Im happy to pull all of the actual resources behind those comments. Otherwise, I'm on the edge of my seat awaiting your reply. Heather: You are getting excited about this, aren't you?!?! :) I will take all of your points into consideration but I'm afraid we will never agree. I don't think all troops are there by choice. I think many of them regret joining. I can't argue with the ones that want to be there but what have they got to show for it. Sometimes you have to cut your losses after a bad decision is made or a plan goes wrong. I don't see any sign of osama bin laden! Heather: I think obama represents change and hope- he inspires me. I've never been one to follow the elections but this year I feel privileged to vote for someone like him (if he gets the nomination). I like his position on immigration too. He is a thought leader and we haven't had one in the white house for a long time. I understand your reasons but I can't support the war anymore. Thursday: Check out our cute hotel, explore Times Square, walk thru Central Park, Chinatown. Friday: Take the ferry from Battery Park to Ellis Island and the Statue of Liberty, dinner at The View (revolving restaurant at top of the Times Square Marriott). Saturday: Empire State Building, SoHo and WTC Memorial Site. Sunday: Shopping Day on 5th Avenue (FAO Schwartz, Saks, Barneys, Tiff & Co.) I also want to go to Dylan's Candy Bar (Ralph Lauren's daughter) and True Religion. Somewhere in that time frame we may travel to Hoboken to have dinner with David, Sandy, Ethan & Theo. Oh - and I also want to see a show on Broadway, see the Meatpacking District, eat fresh bagels and check out the restaurants recommended by Tracey and John's friend that lives in Manhattan. I'm ready to do some serious shopping!